The analyses below summarize where Bitcoin and Blockchain innovations are occurring. 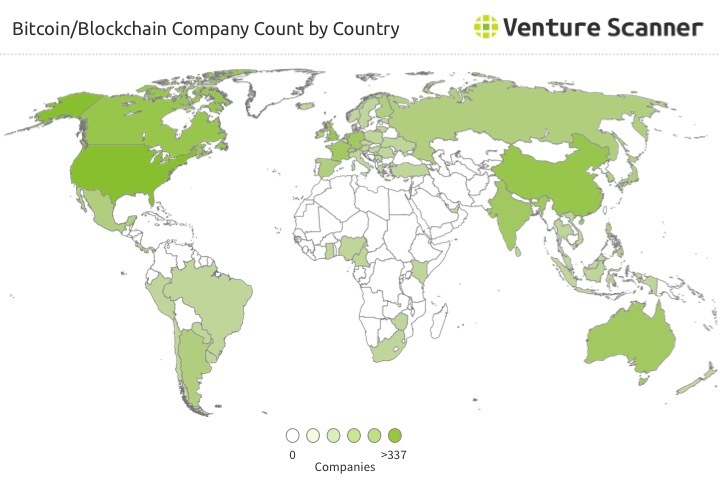 The above map shows the number of Bitcoin and Blockchain companies located in different countries. The United States ranks as the top country with over 330 companies. 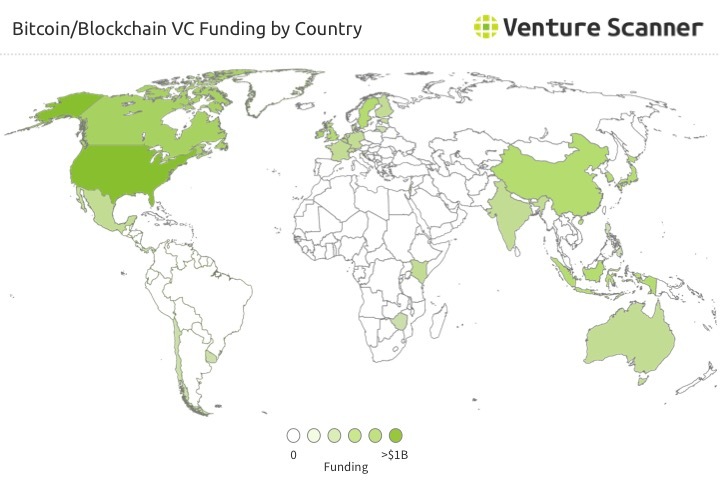 The above map shows the amount of total Bitcoin and Blockchain startup venture capital funding in different countries. The United States has the most VC funding at around $1B. We are currently tracking 882 Bitcoin and Blockchain companies in 12 categories across 73 countries, with a total of $1.84B in funding. Click here to learn more about the full Bitcoin and Blockchain landscape report and database. The above graph summarizes the average age and median age of companies in each Internet of Things (IoT) category. 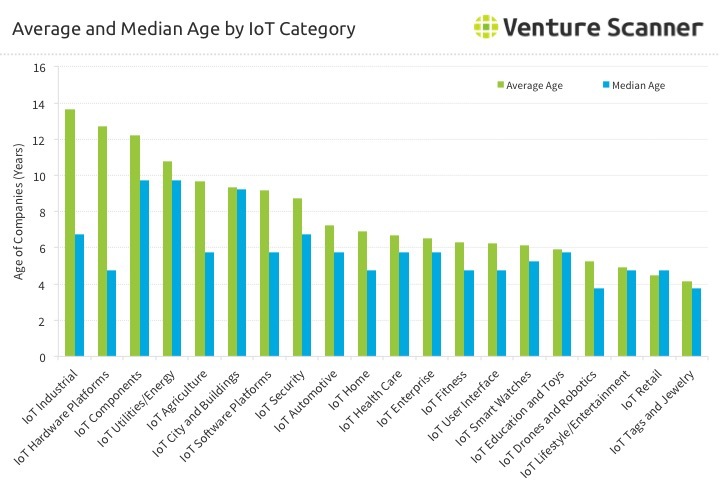 The IoT Industrial category has the highest average age at just under 14 years. IoT Components and IoT Utilities/Energy have the highest median age, at just under 10 years. We are currently tracking 1,490 IoT companies in 20 categories across 46 countries, with a total of $25.3 Billion in funding. Click here to learn more about the full IoT landscape report and database. 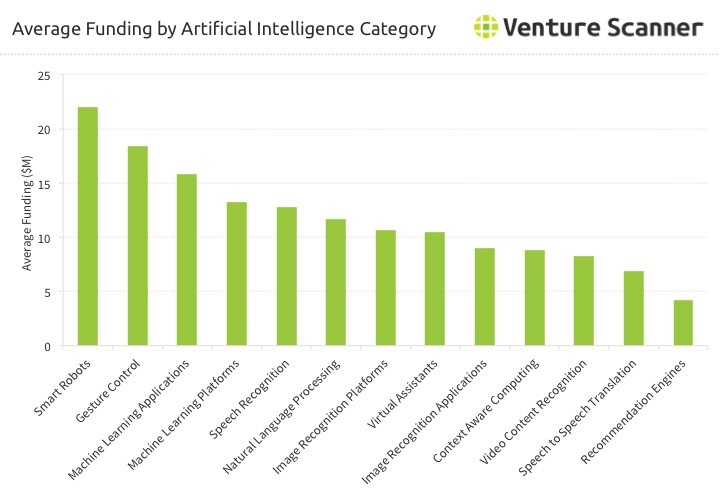 The above analysis summarizes the average company funding in each Artificial Intelligence category. The Smart Robots category leads the sector with $22M in average funding per company, followed by the Gesture Control category with around $18M in average funding per company. We are currently tracking 1,481 Artificial Intelligence companies in 13 categories across 73 countries, with a total of $8.8 Billion in funding. Click here to learn more about the full Artificial Intelligence landscape report and database. 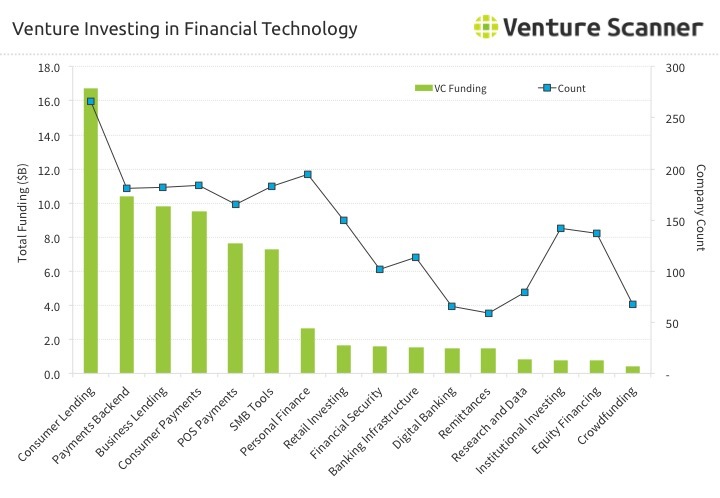 The above graph compares the total venture funding in each Financial Technology category to the number of companies in the category. The Consumer Lending category leads the sector, coming in at over $16B in funding and about 260 startups. The Payments Backend category follows with around $10.5B in funding, and Personal Finance has 195 companies. We are currently tracking 1,952 Financial Technology companies in 16 categories across 59 countries, with a total of $54 Billion in funding. Click here to learn more about the full Financial Technology landscape report and database. 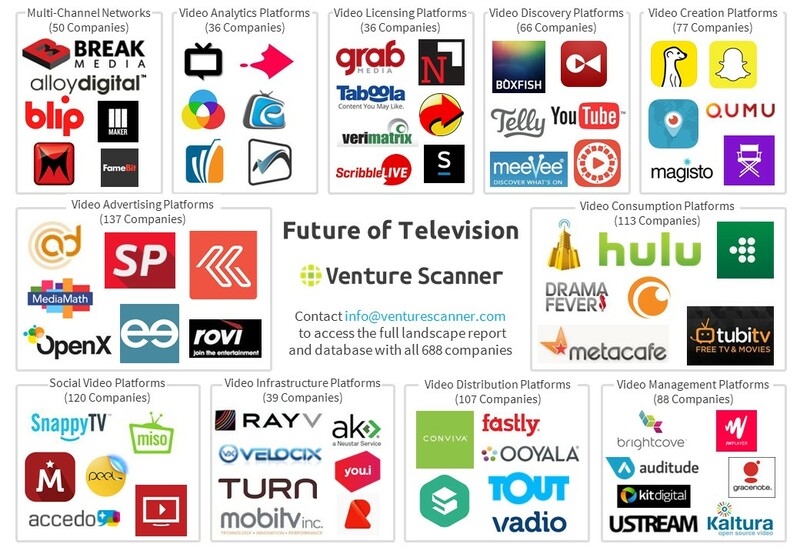 The above sector map organizes the Future of TV sector into 11 categories and shows a sampling of companies in each category. Multi-channel Networks: Multi-channel networks (MCN) are entities that aggregate content from multiple YouTube publishers into one channel. Social Video Platforms: Social networks built around video/TV content, and applications used by the end-users alongside TV programs to offer enhanced viewing experiences. Video Advertising Platforms: Video Advertising Platforms include ad networks that help marketers by finding and aggregating the supply of publisher inventory, ad servers that facilitate the delivery of ads from a stored server, and marketplaces that connect buyers and sellers over digital advertising space. Video Analytics Platforms: Video Analytics Platforms measure and provide viewer analytics and social media data around TV shows to publishers and content creators. 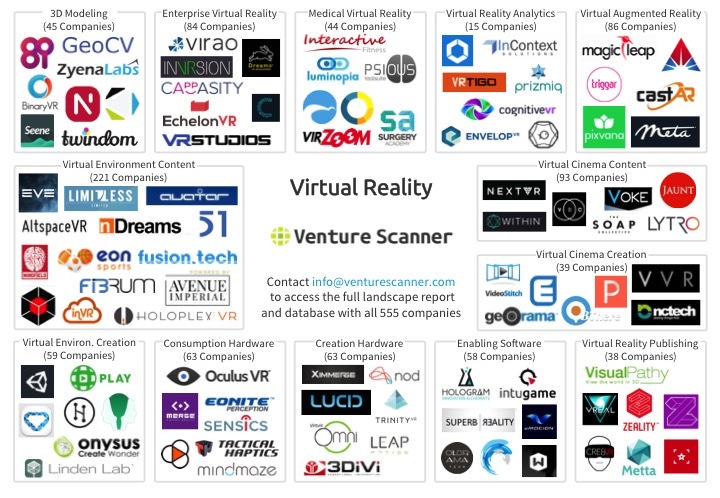 The above sector map organizes the Virtual Reality sector into 13 categories and shows a sampling of companies in each category. 3D Modeling: Companies that enable the user to capture and render everyday objects in 3D. Examples include 3D full-body scanners, 3D head modeling, and 3D merchandise modeling. Enterprise Virtual Reality: Companies that utilize virtual reality for enterprise/business purposes. Examples include virtual work rooms, virtual real estate visualizations, and virtual data visualizations. Medical/Health Virtual Reality: Companies that utilize virtual reality for medical and health/wellness purposes. Examples include virtual meditation environments, virtual fitness simulations, and virtual environments to treat eye illnesses. 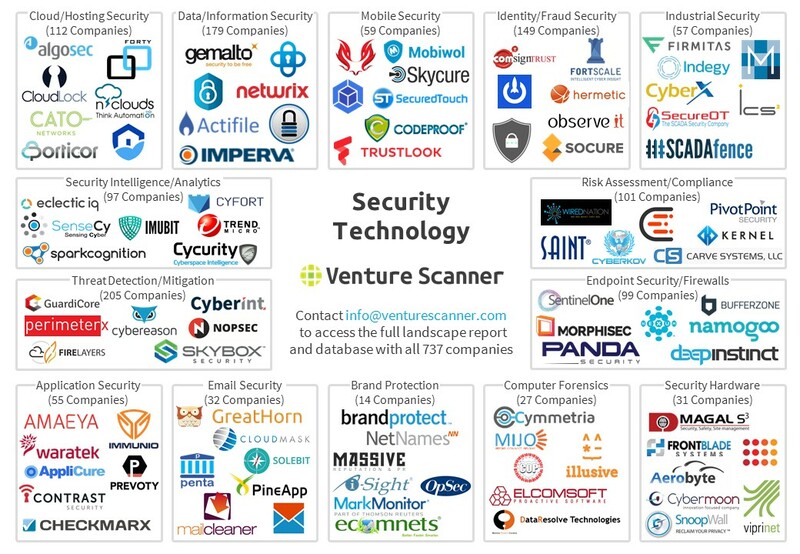 The above sector map organizes the Security Technology sector into 14 categories and shows a sampling of companies in each category. Data and Information Security: Companies that help protect electronic data from unauthorized external access or threats. Examples include data leakage prevention, file-based security, and enterprise data encryption. 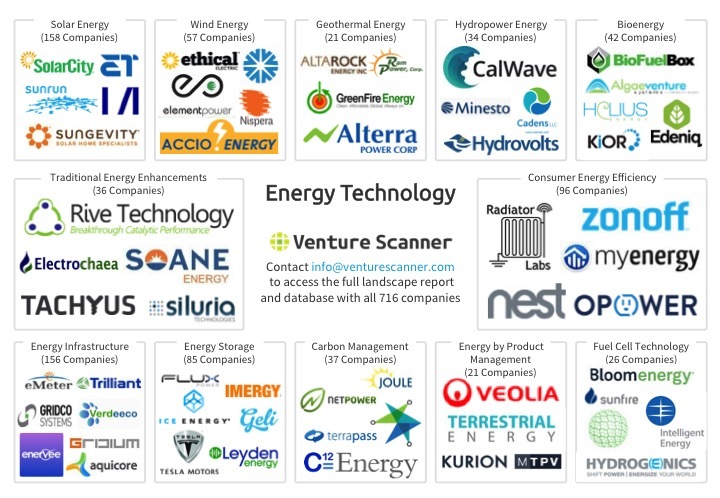 The above sector map organizes the Energy Technology sector into 12 categories and shows a sampling of companies in each category. Bioenergy: Companies that generate energy from biomass. Examples include bioenergy development, research, and monitoring. Carbon Management: Technologies that aim to reduce carbon dioxide and other greenhouse emissions. Examples include solutions that capture, sequester, and store carbon emissions, carbon emission data analytics, and carbon emission recycling. Consumer Energy Efficiency Tools: Companies that enables consumers to be more efficient with their energy use. Examples include monitoring devices, predictive/proactive devices, and solutions allowing for the streamlined application of renewable energies. Energy Infrastructure: Enabling technologies in the production of energy. Examples include smart metering, energy monitoring/data analytics, and smart grid optimization. 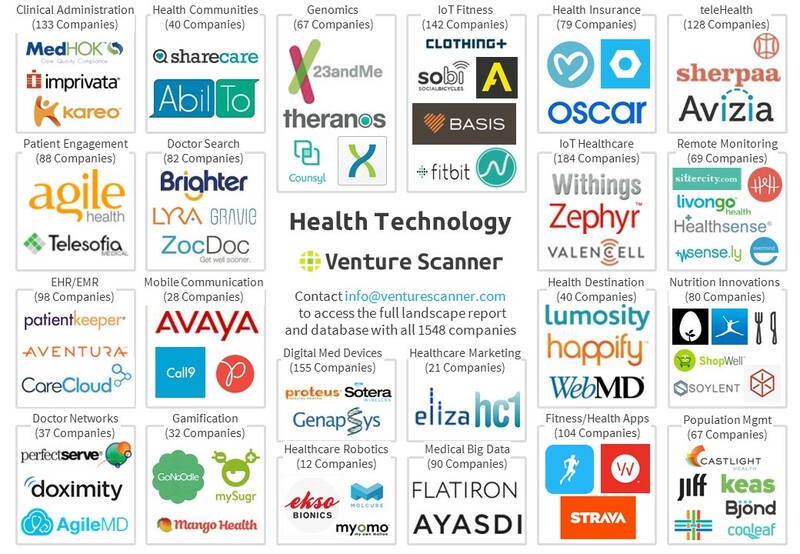 The above sector map organizes the Health Technology sector into 22 categories and shows a sampling of companies in each category. Clinical Administration and Backend: Companies that help foster management of healthcare-related administrative tasks. Examples include scheduling, patient transfers, billing, and compliance. Digital Medical Devices & Diagnostics: Companies that manufacture a new generation of IT-enabled medical devices and diagnostic tools for use by doctors and other clinical staff. Examples include tools for use in surgery, monitoring equipment, and detection equipment. Population Health Management: Services that help manage and analyze patient data across groups of people to create actionable insights for healthcare providers. Examples include population data management, coordinated care across populations, and streamlined reporting on individuals. 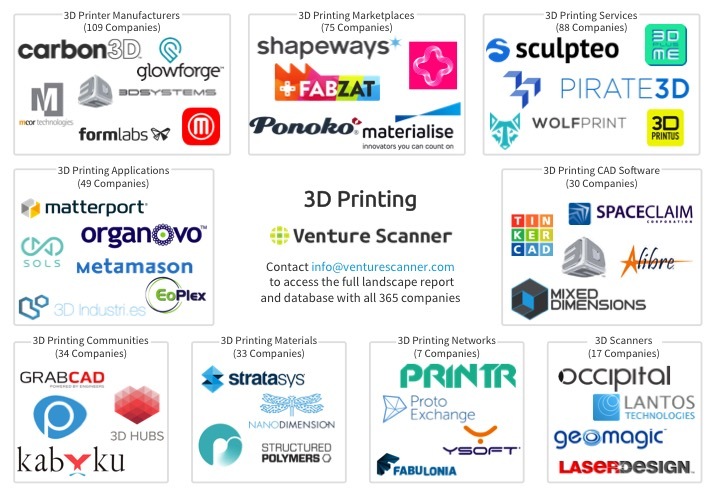 The above sector map organizes the 3D Printing sector into 9 categories and shows a sampling of companies in each category. 3D Printer Manufacturers: Companies that manufacture 3D printers and accompanying hardware (e.g. injection heads). There are numerous players in this space from large incumbents, to emerging crowdfunded projects. 3D Printing Applications: Companies that highlight specific use cases and advantages of 3D printing (e.g. mass customization). Emerging trends in the space are health, dental, consumer applications (e.g. custom eyewear), rapid manufacturing. 3D Printing CAD Software: Computer Aided Design software that enables users to upload, create, and modify 3D models. Some of the newer CAD software can be used directly through the browser, reducing friction for e-commerce websites or consumer facing services. 3D Printing Communities: Groups and websites that organize multiple users around 3D printing.